On this last day of February, we are due for a fitness check-in. Two months have gone by since we made our new year's resolutions, and we can't speak for you babes, but we definitely need major March motivation to get back on track! 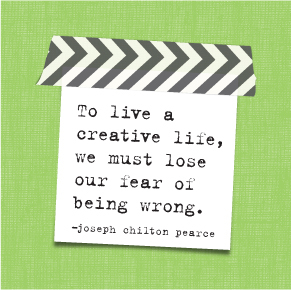 That's why we're coming to you today with not 1...2...or 3 fitness planner posts, but FOUR! 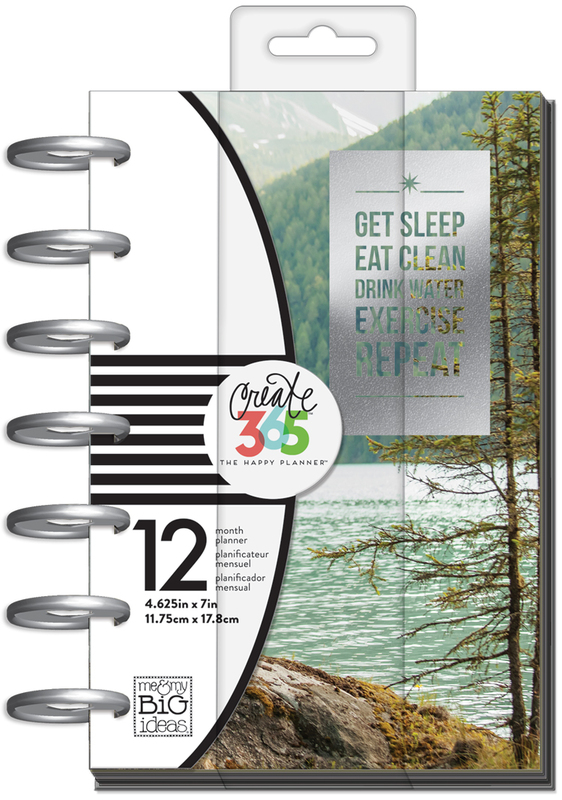 (1) First, we look at how mambi Design Team member Michelle Weissert (IG | blog) customized her CLASSIC Fitness Happy Planner® into an 'Overall Health' planner to track her not only her food & exercise for the week, but her mood, sleep, and kindness to herself too. (3)...while Design Team member Gretchen Klobucar (IG | blog) is sharing how she customized her MINI fitness planner to prep for a March Fitness Challenge. (4) Lastly, we take a look mambi Design Team member Chantal Kuaea's (IG | blog) past fitness spreads of completed, healthy, successful weeks - to use some of what worked then in this upcoming new month. "Confession time: I haven't been doing as well as I wanted to for my 2017 resolutions, but I have been trying to keep my health in mind. One thing I did was make a spread tracking different aspects of my overall health in my CLASSIC 'Fitness' Happy Planner®. 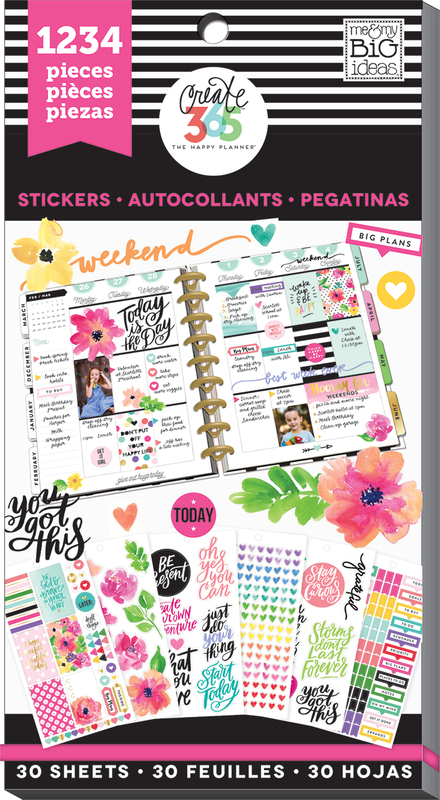 Instead of tracking each meal, I covered up the sidebar with stickers from the 'Today Is The Day' Value Sticker pack. I labeled them: gratitude, food, sleep, self-kindness, and mood. I covered the calorie counter with a white-out runner and put a clear 'Steps:' sticker over it. At the bottom, I left the exercise part the way it was, but I also wrote down why I wasn't working out for that day throughout the week. I set my goals for the week on the side to keep me focused on what was important. While I might not be down as many pounds as I want to be, at least I know I'm taking care of myself when it comes to the big picture!" "I wanted a divider to easily find my page in my MINI planner, but also encourage and inspire me to keep on going, as well as a visual reminder of my goal and what I have achieved. I used a MINI pocket page and found mambi cards (you could even use stickers) that had great motivational sayings that spoke to me. Then I used a mambiSHEET for the center and added a 'goal' sticker along with some alpha stickers to add my weight loss goal. For every 5 lbs I loose, I am going to add a large confetti dot I created with a round punch, along with the date I achieved the goal. I can’t wait to watch the pocket fill up!" "I'm gearing up for a clean eating and exercise challenge for the first 24 days in March. Planning ahead for challenges like these is the best way to succeed. I mapped each day's exercise into my monthly spread of my Fitness Happy Planner®." 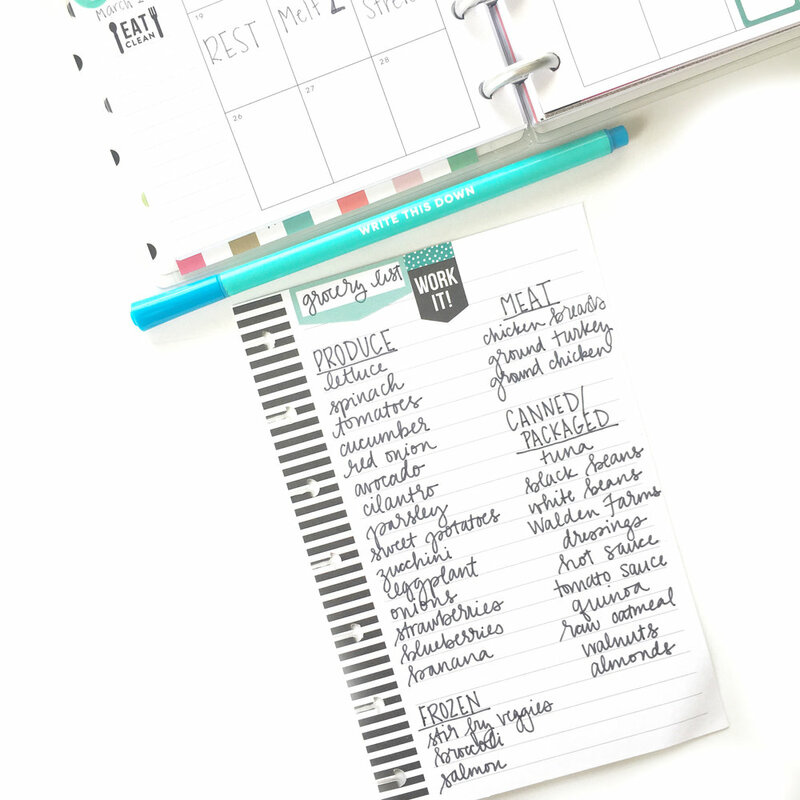 "I also created a quick glance meal plan sheet for my go-to food choices during this time frame by doctoring an hourly insert for the mini Happy Planner® with one roll of mambi washi and some stickers from the 'Fitness' sticker value pack. Finally, I planned out my grocery list with all the food I need to purchase for the challenge. I feel prepared to stick to the clean eating principles and follow this exercise regimen! I'll be excited to track everything in the weekly spreads of my MINI fitness planner." "I used my MINI 'Fitness' Happy Planner® to stay on track prior to my November 11th wedding and two months into this new year, I'm looking back on those pages and reflecting on how I tracked my meals and recorded my workouts. I made sure that I did not over-indulge and attended the gym the 5 days a week, and by looking back at how I was successful, I feel motivated to have a healthy and fit March." Shop some of the supplies our Design Team used by clicking on the items below.